Hello blog world! Happy New Year! I have been MIA with the flu, even though I got the employer-mandated flu shot. Guess the experts didn't come up with the best vaccine this year. I know several others that have had flu shots AND the flu this year, as well, so I have not been alone. Keep washing those hands and stay away from those with symptoms (if you can - avoid people who show up to work sick - they are your worst enemy!!!). I used a Lost Coast Designs image and isn't he just fun?!!! Reminds me of Mardi Gras!!! Dp is from Bo Bunny. The SU! sentiment is cut out with an MFT fishtail die. The sketch is from Try Stampin' on Tuesday. Please think positive thoughts for my sweet Sadie who turned 16 last month. I discovered a new lump tonight and need to get the vet to check it out. Doesn't feel like the usual lipoma so I am a bit worried. Fantastic card hun, love the mono look! I donate all my cards to our local wildlife rescue centre, where we help out & I know they appreciate every little bit of help. Fantastic card! Love that dog image and the sentiment is perfect!! Thanks for joining us at Try Stampin' on Tuesday. Hope to see you again soon! 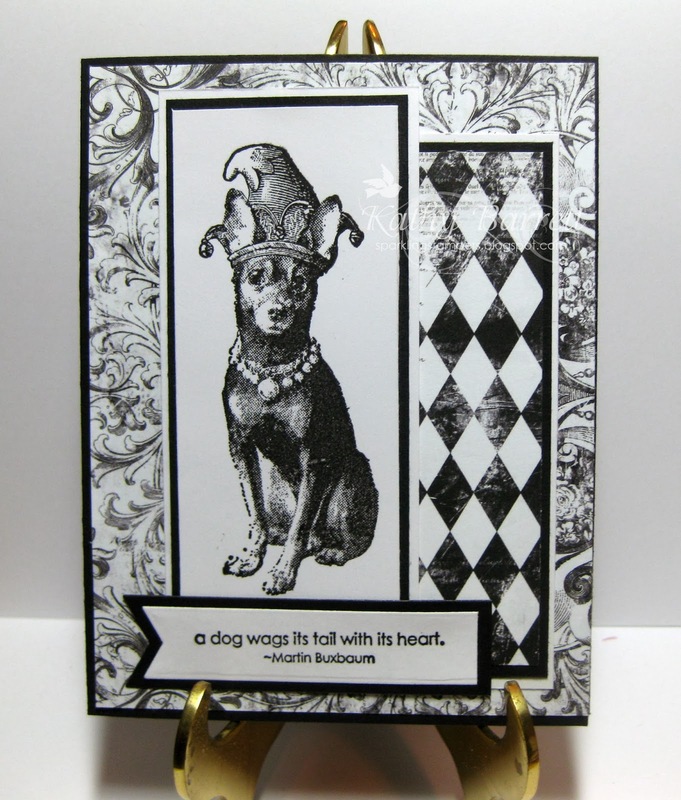 Love the sentiment on this one and beautiful black and white motif. Thanks so much for playing at Crafty Sentiments!! Darling card, it makes me smile! Thank you for joining in on this weeks challenge at the Crafty Sentiments Designs Challenge. I hope you play along with us again soon! This IS a very fun card! The dog is adorable! And he reminds me of Toby. The black and white paper is matched perfectly--you did a great job on this!